Dear Readers, just when I think that I’ve spotted every species of bird who is likely to visit the bird table, someone new drops by. 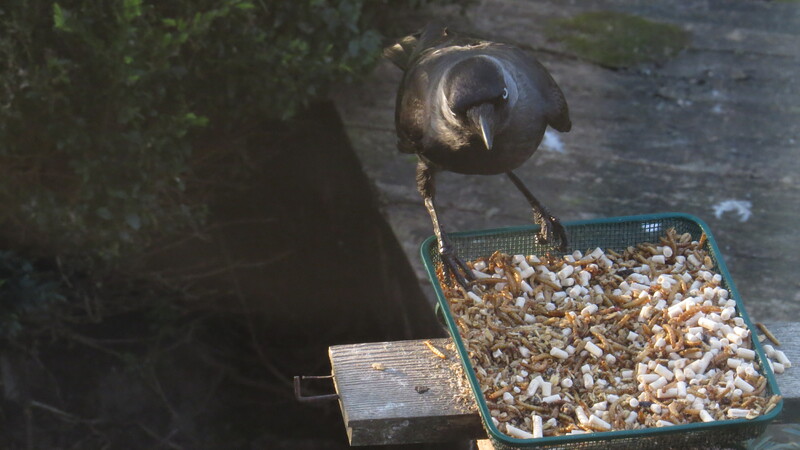 And so it was on a sunny evening this week, when I glanced out of my upstairs window to see a jackdaw pecking up the suet pellets. 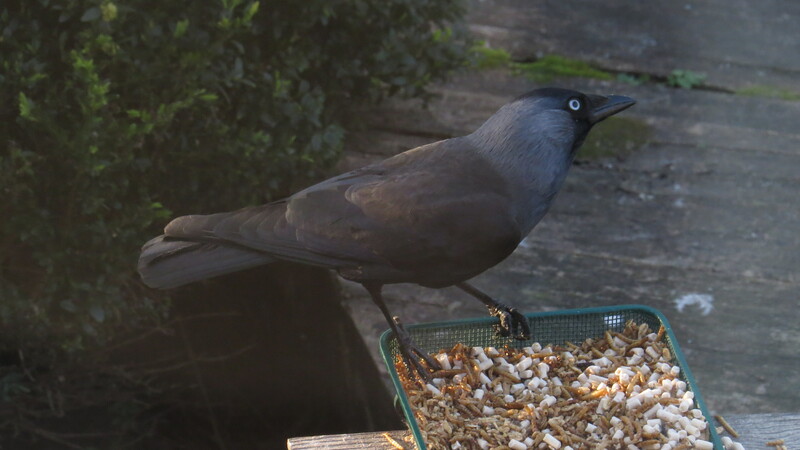 This is the first time I have ever seen a jackdaw in the garden: they are rare birds in London, though when I visit my parents in Dorset they are everywhere, chuckling away and playing above the roofs. 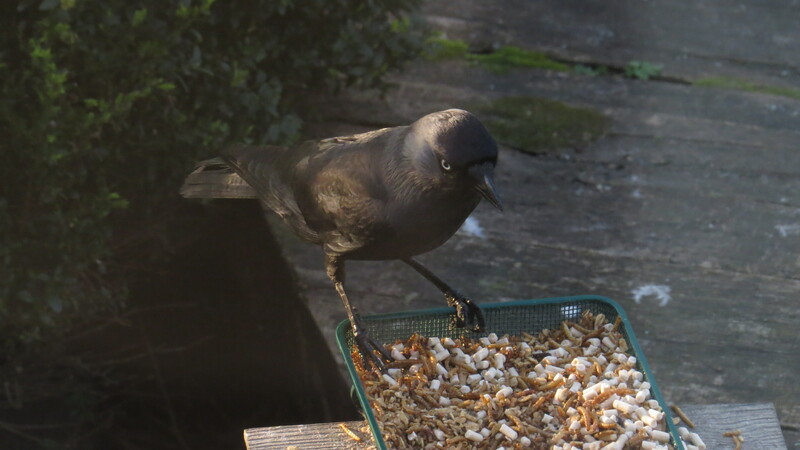 I have always been fond of Jackdaws: they are intelligent and adaptable birds, the smallest of the UK’s crows, and they would have been a familiar sight in central London at the end of the nineteenth century. They have often been described as ‘ecclesiastical birds’ because of their habit of nesting in church towers: up to 1889 they bred at St Paul’s Cathedral, and they were also nesting in St Michael’s Church near the Bank of England at this time. In Wales Jackdaws were considered to be sacred because of their religious nesting places: the birds were said to be ‘shunned by the devil’. Alas, these days they avoid most of London. There have been various theories as to why, but the usual double-whammy of unavailability of habitat and food is probably to blame. Jackdaws would have eaten grain that was meant for the horses that were once prevalent in the city, and would have used the hair and wool from the many domesticated animals that were driven down to Smithfield to line their nests. I wonder if it is coincidence that the one place in London where jackdaws are regularly seen is Richmond Park, with its herds of deer. 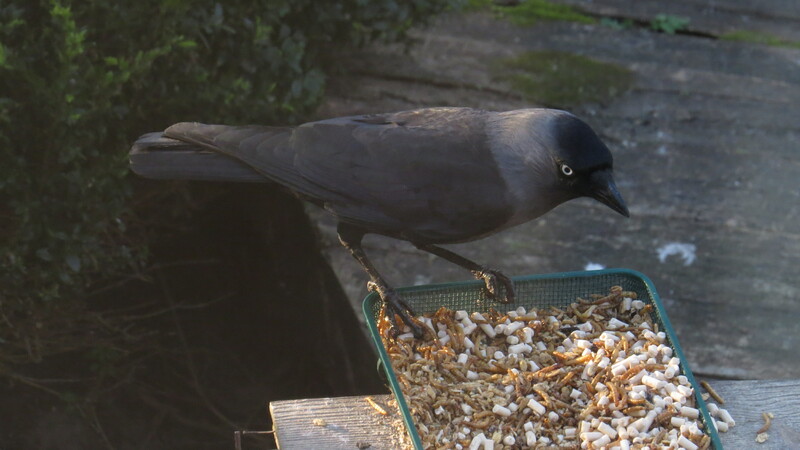 I find the jackdaw a most handsome bird. I love the frosty cape around his neck, and the bouncy way that he jogs about: while crows always remind me a little of Prince Charles as they walk around with their metaphorical hands clasped behind their backs, jackdaws have much more of the Tigger about them. But most of all I love those ice-blue eyes. The naturalist W.H.Hudson described them as ‘small malicious serpent-like grey eyes’ but I can only think that he looked with a jaundiced attitude. To me, the eyes of a jackdaw show a sharp intelligence, and a clarity of intention. This bird had just noticed me standing at the bedroom window with my camera, and was trying to decide if I was a threat or not. Evidently the suet pellets won over immediate flight. This was a hungry bird, and most of the contents of the bird table ended up on the patio, where the starlings and squirrel made short work of them. Jackdaws are normally seen in flocks, but pair for life within this group. A pair will stay together even after multiple cases of breeding failure. Single birds are at the absolute bottom of the pecking order (as noted by Konrad Lorenz in his book King Solomon’s Ring) but if a bird finds a new mate, his or her status depend on that of their partner. As I watched the bird in my garden, I was feeling a little sorry that he or she was on their own. And then something disturbed him or her and a second jackdaw emerged from under the bird table as they both flew off together. Call me a tired old romantic, but it warmed my heart. There is something very special about witnessing a new visitor to the garden, especially when you’ve been feeding for years and think you’ve seen everything. Hah! Nature has a way of puncturing such pomposity. I sometimes think that I haven’t even begun to notice the secret life of my garden, let alone understand it. There’s enough in this little spot of ground to keep me busy for the rest of my life. All blog content free to use and share non-commercially, but please attribute and link back to the blog, thank you! This entry was posted in London Birds on April 1, 2017 by Bug Woman. What superb photos you’ve taken of your very special visitor. They are such beautiful birds. 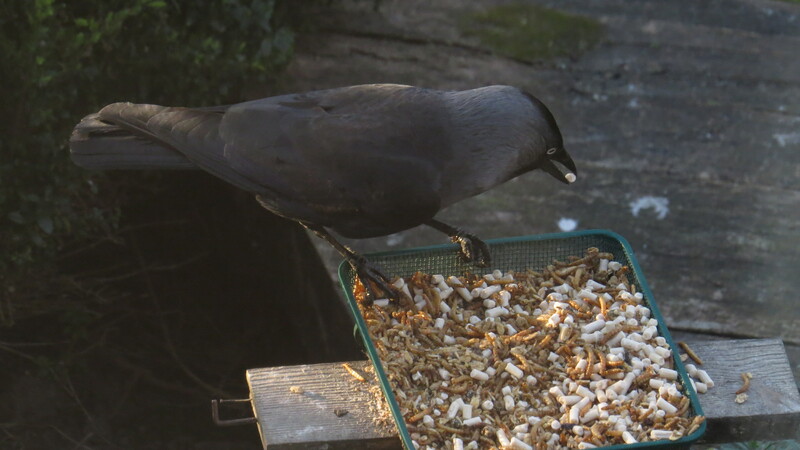 I’m very lucky as I get lots of jackdaws in my garden. I don’t know if it’s a coincidence but every time I go out into my garden, a jackdaw somewhere up above lets out a call. I think they recognise me as the one who puts the food out! I love that unexpected sighting. Jackdaws are quite common in places around here and I love to hear their chat and see those beautiful eyes. I saw three of them this weekend at Hainault country park where there is a small farm (and grain?) but I didn’t know what they were until now, so thank you. I know that park! I used to live in Chadwell Heath, and it was where I used to liberate any frogs that my evil cats caught in the garden. Plus, I saw a grass snake there once, too. And the farm is good fun – interesting that you saw jackdaws there! How marvellous, I adore them too. We have quite a few here and I love to hear them ‘Jack Jacking’ on the roofs. another really super post – thank you.